First and second place team winners, from left, Josh McManus, Cameron Garcia, Geste Bianchi and Ayrton Garcia. Teams countywide competed in the OC High School Beach Volleyball Championship last weekend, Sept. 29 and 30, at Main Beach in Laguna, and the hometown advantage may have played a role in the outcome. 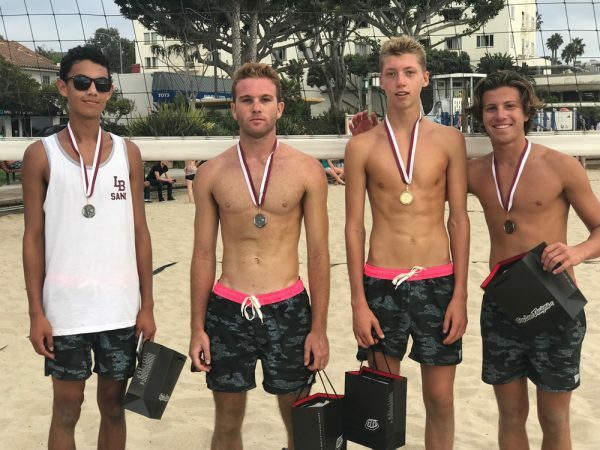 Laguna Beach High School players Ayrton Garcia and Geste Bianchi (LBHS) took home the first place medals, beating out their classmates Josh McManus and Cameron Garcia and winning the third and decisive game 16-14 in the late afternoon sun. LBHS made it a clean sweep on the podium when Enzo Sadler and Sam Burgi won the third place game over Erik Weisinger and Jack Colby from Los Alamitos High School. This is the second time the OC High School Beach Volleyball Championships have been held at Main Beach, and the second time the Breakers have taken home the first place medals.